This stunning space wallpaper is a false-color mosaic, made from infrared data collected by NASA's Cassini spacecraft. It reveals the differences in the composition of surface materials around hydrocarbon lakes at Titan, Saturn's largest moon. This stunning space wallpaper is a false-color mosaic, made from infrared data collected by NASA's Cassini spacecraft. It reveals the differences in the composition of surface materials around hydrocarbon lakes at Titan, Saturn's largest moon. 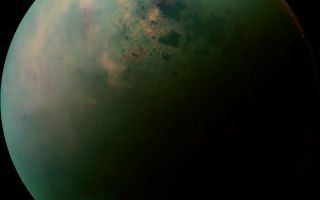 Titan is the only other place in the solar system that we know has stable liquid on its surface, though its lakes are made of liquid ethane and methane rather than liquid water. While there is one large lake and a few smaller ones near Titan's south pole, almost all of Titan's lakes appear near the moon's north pole.